How do I use my virtual card? 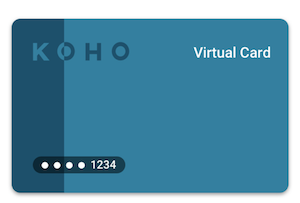 Open your KOHO app and More > Cards to see your sparkling new Virtual Card! What, you may be wondering, is a virtual card exactly? What are the perks of a virtual card? Note: If you're ever traveling and you aren't able to view your virtual card, don't be alarmed. Our processor blocked the virtual card in some countries to protect your information!